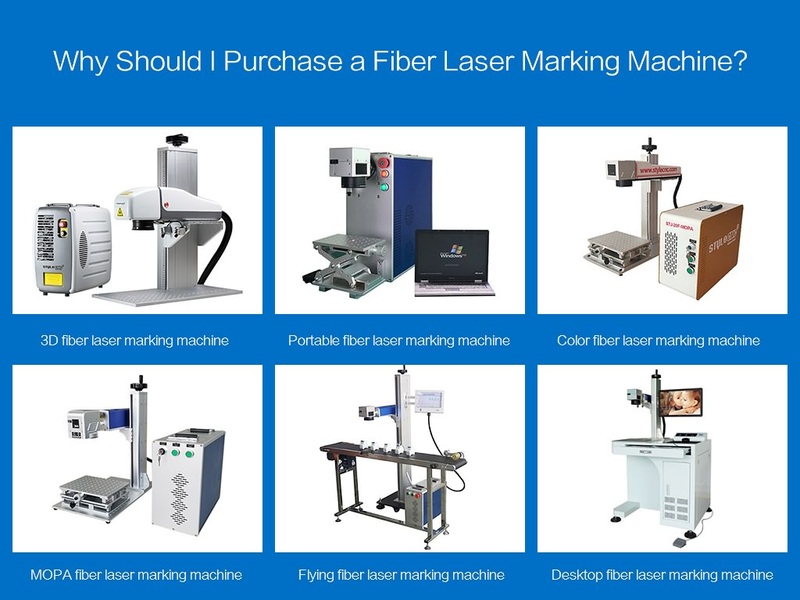 Why Should I Purchase a Fiber Laser Marking Machine? When you purchase a fiber laser marking machine, you should know the fiber laser marking machine advantages of small volume, good beam quality, high marking speed and precision, low cost, free maintenance. Fiber laser marking machine has features of nontoxic, non-deformable, pollution-free, wear-resistant, stable in performance and moderate in price. Fiber Laser marking machine can control the depth of marking at will, and it can work for a long time. Adopting the integrated design structure, the new light road sealing method, the overall stability and reliability, the appearance is beautiful and high grade. It inherits the maturity and practicability of the previous generation of solid laser marking machine, and improves the stability of the whole machine by upgrading the software and control system. It can be marked with arbitrary information such as graphic logo, signs and text, which has the characteristics of fine and beautiful engraving and never wear. 1. Fiber Laser marking equipment can be processed for a variety of metal and nonmetallic materials, especially for high hardness, high melting point and brittle materials. 2. Fiber laser marking equipment is non-contact processing, no damage to the product, no tool wear, good marking quality. 3. The laser beam is thin, the processing material consumption is very small, and the processing heat affected zone is small. 4. The processing efficiency is high, using computer control, and the automation is easy to be realized. Why Fiber Laser Marking Machines are the best choice? The fiber laser marking machine has advantages of small volume (without water cooling, using air cooling), good beam quality (fundamental mode) and free maintenance, it is mainly composed of laser, vibration lens, playing card is composed of three parts, the fiber laser marking machine has high quality beam, the output center for 1064nm, the whole life in 100,000 hour or so, compared to other types of laser marking for longer life, the electro-optical conversion efficiency is more than 28%, compared with other types of laser marking machine and the conversion efficiency of 2%-10% has great advantages in energy saving and environmental protection and other aspects of outstanding performance. 1. The laser beam quality of fiber laser marking machine is good, which is close to the diffraction limit. TEM00 based transverse mode output, M2 near 1, the beam divergence angle of 0.24mrad. 2. The fiber laser has high repetition rate and stable output power. The single pulse energy change is less than 1%. Even the high speed laser marking can be finished. It can also control the depth and shape of the spot accurately. 3. The fiber laser can have high power, the power of the plug is as high as 20%, and the electric light conversion power can reach 70%. 4. The Fiber laser marking system has strong environmental and habitual ability, and can be connected to normal operation in high sensational and high humidity environment. 5. Fiber Laser marking system does not need water cooling equipment, small volume, high power, high reliability, long term free repair, saving operation cost. Fiber laser marking equipment can mark a variety of metal and nonmetal materials, iron, copper, magnesium, aluminum and other common metal, gold, silver, titanium, platinum and other precious metals, various metal oxide marking, in addition, it can also mark all kinds of hard alloy, high oxide, electroplating, plating, ABS, epoxy resin, printing ink, such as engineering plastics, the application range is very wide. In view of the standard superior performance of fiber laser marking machine, it is widely used in plastictranslucent keys, IC chip, digital products, precision machinery, jewelry, sanitary ware, measuring and cutting tools, watch glasses, electrical appliances, electronic components, hardware accessories, hardware tools, mobile phone parts, auto parts, plastic products, medical devices building materials, pipes and other high precision product identification. License: The text of "Why Should I Purchase a Fiber Laser Marking Machine?" by STYLECNC is licensed under a Creative Commons Attribution 4.0 International License. Can fiber laser marking on non-metal materials?